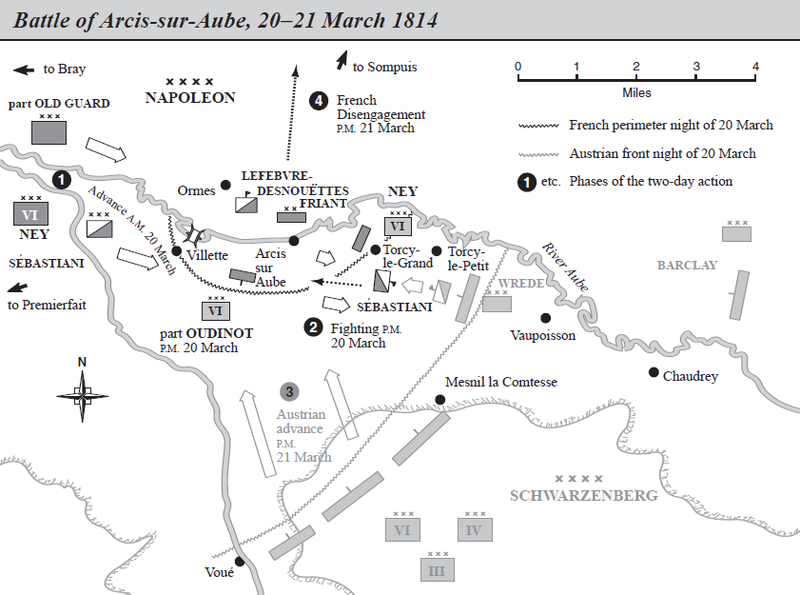 Napoleon defeated Prince Karl Phillip zu Schwarzenberg’s Army of Bohemia at Montereau on 18 February 1814, but Schwarzenberg was able to retreat, preventing Napoleon from achieving a decisive victory. Representatives of the Coalition of Austria, Britain, Prussia and Russia met at Chaumont on 1 March. Eight days later they signed a treaty, which was dated 1 March, promising to continue the war and not to sign individual peace treaties with France. Britain agreed to pay £5 million in subsidies in 1814, to be evenly divided between the other three signatories. Napoleon was offered peace if he accepted the pre-Revolutionary War frontiers of France; he rejected this offer. Even before the signing of this treaty Prince Gebhardt von Blücher’s Army of Silesia had resumed its advance northwards. 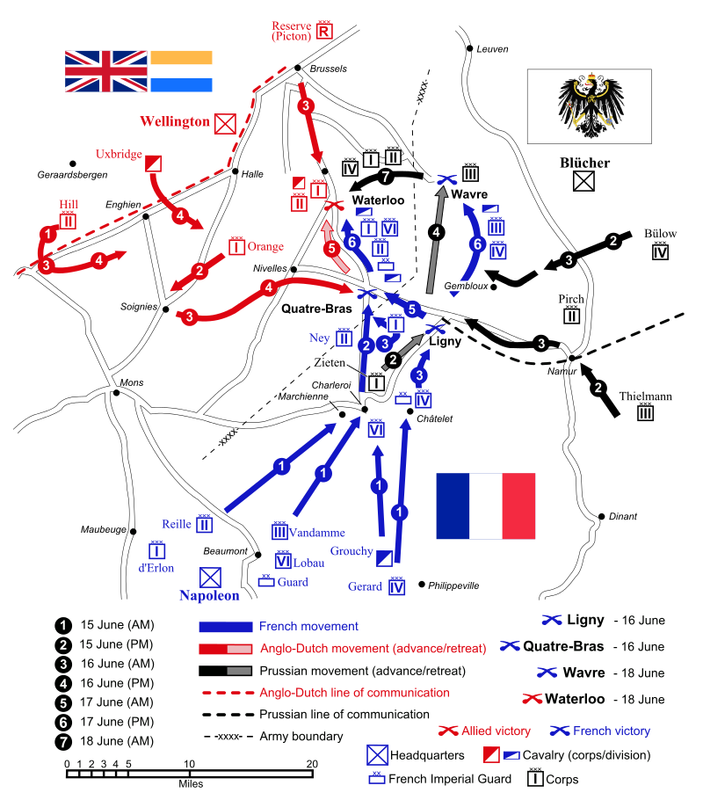 It had been reinforced back to 53,000 men after its defeats at the Battles of Champaubert, Montmirail and Vauchamps between 10 and 14 February 1814. Blücher was heading for Paris, but David Chandler notes that Napoleon doubted that Blücher would do something as risky as resuming his advance on Paris.’ However, the Emperor planned to attack the Army of Silesia’s rear with 30,000 troops of the Imperial Guard. Marmont and Marshal Édouard Mortier’s corps would pin Blücher frontally. On 1 March Blücher ordered his army to cross to the north bank of the Marne after receiving reports that there were French troops advancing on him. All the bridges across the Marne had been burnt by the time that Napoleon reached the south bank. He had no bridging train, so had to wait whilst a bridge was repaired. He believed that he would have been able to decisively defeat Blücher here and to have destroyed Schwarzenberg’s army at Montereau had he possessed a bridging train. Blücher was moving north with the intention of joining the Prussian corps of General Friederich von Bülow and the Russian corps of General Ferdinand von Winzengerode. By 5 March they had combined, giving Blücher over 100,000 men. The Emperor still intended to advance on Laon and attack Blücher. 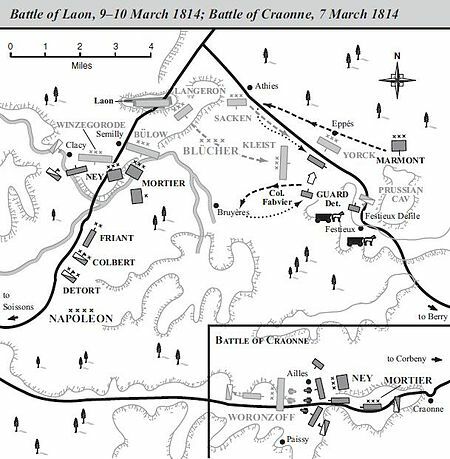 However, on 6 March he learnt that there was a substantial enemy force on the Plateau of Craonne. He assumed that it was Blücher’s flank or rear guard. In fact the Prussian wanted Napoleon to attack General Fabian von Osten-Sacken’s corps and Winzengerode’s infantry, commanded by General Mikhail Vorontsov. Winzengerode’s cavalry and General Friedrich von Kleist’s Prussian corps would then sweep round the French northern flank and attack their rear. Dominic Lieven notes that this plan left a large portion of Blücher’s army unengaged, and that the flanking attack would have to move over difficult terrain that had not been properly reconnoitred. It consequently moved very slowly and failed to get into action. French author Houssaye gives Napoleon 30,000 men and Vorontsov 50,000 men. 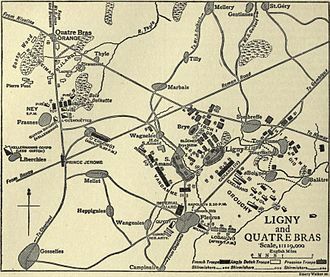 British military historian Digby-Smith gives 33,000 Frenchmen and 24,000 Russians. Another British author Maycock gives 30,000 Frenchmen and 20,000 Russians. Vorontsov had a strong defensive position in the centre, based on the Heurtebise farm. Napoleon intended to pin him frontally, with 14,000 men led by Marshal Michel Ney attacking Vorontsov’s northern flank. Ney attacked just after 10 am. This was earlier than planned, and the 72 guns of the Imperial Guard artillery were not ready to support him, resulting in his attack failing. Vorontsov was able to hold his position comfortably until the early afternoon, when French reinforcements arrived. Blücher then ordered him to withdraw, as the failure of the Coalition flank attack meant that there was no reason to continue the fight. Vorontsov was reluctant to retreat, but eventually obeyed repeated orders by Sacken to fall back. His men withdrew in good order. Chandler gives casualties of 5,000 Coalition and 5,500 French killed and wounded. Lieven agrees on the Coalition casualties, but notes that the French initially admitted to 8,000 casualties until later French historians, such as Henri Houssaye, downgraded this to 5,400. He adds that, whilst the French held the battlefield at the end of the day, they captured no guns and very few men. 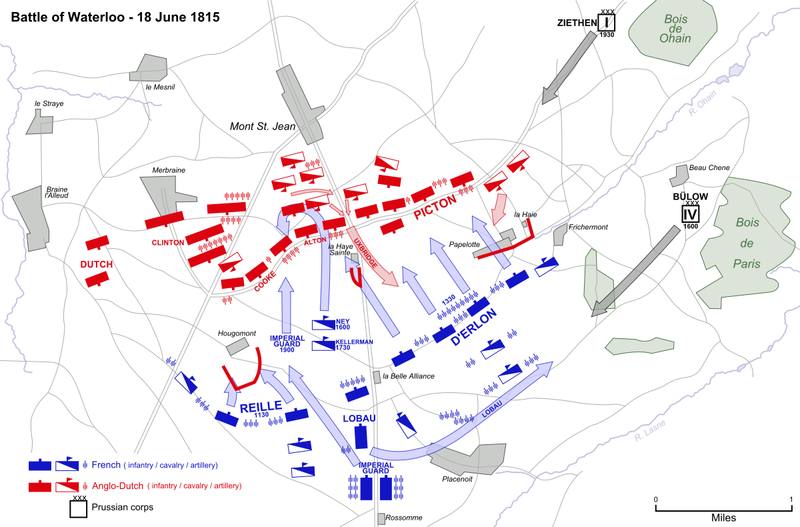 The French could not afford battles in which they lost even the same number of men as the enemy, so this was a bad result for them. Unlesss otherwise stated troop numbers are from D. Chandler, The Campaigns of Napoleon (London: Weidenfeld & Nicolson, 1966), pp. 984-88. Quoted in Ibid., p. 984. Quoted in Ibid., p. 985. Quoted in Ibid., p. 986. D. C. B. Lieven, Russia against Napoleon: The Battle for Europe, 1807 to 1814 (London: Penguin, 2010), pp. 499-502.